This story took place after the financial collapse, but before the volcano Eyjafjallajokull had one of her famous angry moments. In fact, it happened only a few days before Eyjafjallajokull decided to erupt. By a coincidence my working colleague Maria and I took the very last plane back to Sweden, the same night the volcano had that last eruption which stopped the airline traffic for weeks after. We made a stop at this ordinary gas station, right by the so called ringroad, close to Reykjavik. The gas station could be anywhere in a Scandinavian country, during any of the four seasons; remember that we have about 250 (at least) different words for rain – but the language immediately reveals the destination. 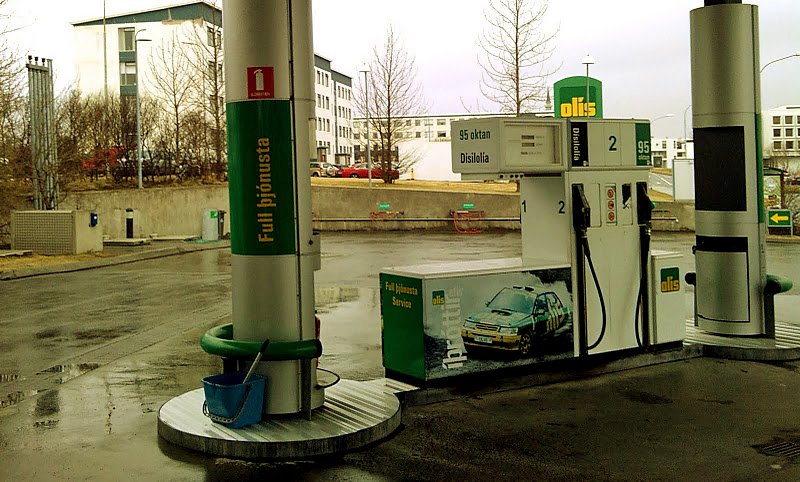 We managed to pick the full service tank – we should have understood that full þjónusta. The brand by the way, is oliuverzlun. It means oil business. Very exotic and innovative.